And we're not just talking about the booze and drugs — although those are definitely part of it. Like, a large part of it. Possibly all of it. According to data published in QJM: An International Journal of Medicine, Australian researchers looked at 1,000 obituaries in the New York Times between 2009 and 2011 to determine the average age and cause of death. They learned that business people and politicians live an average of 83 years — maybe they refused to concede to death? — and that academics, historians, and economists live on average to 82 years. Not bad. However, if you're a writer, composer, or artist, prepare to kick the bucket at around 79, and, even worse, if you're a performer — actor, singer, or musician — or a sport star, your average age of death is just 77 years old. And how will you die? The researchers noted that cancer, particularly tumors in the lungs, was more common in performers. Professor Richard Epstein said: "A one-off retrospective analysis like this can't prove anything, but it raises some interesting questions." He speculates that if celebrities do have shortened lifespans, there are many reasons for this — unique stress of fame, psychological and family pressure, and poor health behaviors. Sound familiar, Most Everyone Featured Daily in Dirt Bag? Man, being a celebrity might have its many perks — but if you d0n't know yourself or have people you can trust, I can only imagine how difficult it would be to have 24/7 access to excess. I can barely control myself around this half-eaten bag of Tings; unlimited supplies of liquor and coke would be no bueno. 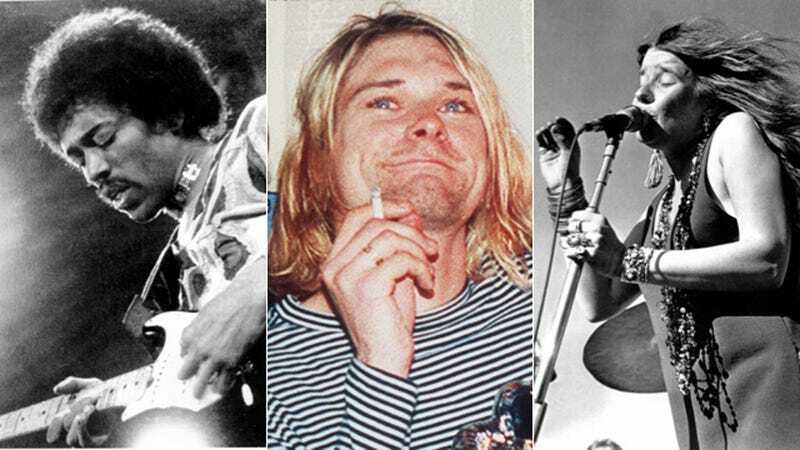 Or MAYBE the 27 club is just skewing results? CONSPIRACY THEORY TIME. Please place your bets below!